Posted on April 28, 2017 , in Home Gyms. 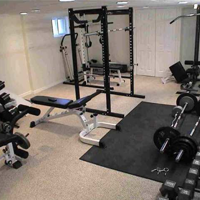 If you’re thinking about building a home gym but keep putting it off because of the expense, there are many things you can do to create a phenomenal gym while investing less money. Below you’ll learn how to create a home gym that will get you in great shape without breaking the bank. Ideally, your home gym should get its own space to give you privacy and focus during your workout. A small room with a 6-by-6 foot yoga mat, a mirror to keep your form in check, a small stereo system for motivation, and the equipment you most need is a good place to start. Before you start investing in equipment, think about your goals. Do you want to lose weight? Gain cardiovascular fitness? Improve your strength? Or do a combination of these things? The best choice if you’re looking to lose weight and improve your overall fitness level is to do both cardio and resistance training, which will help you lose the most weight while keeping your muscles toned. If you can afford it, investing in a quality set of adjustable dumbbells is a great way to go. If not, buy three sets of weights you think you’ll use most often. For example, for a beginner woman, this may be a 5 pound set, a 10 pound set, and a 15 pound set. While many people imagine dumbbells being useful only for upper-body exercises, you can also use them to add resistance to squats, lunges, and other lower-body exercises with them. A stability ball is one of the best investments you can make in your home gym. By using it to do crunches, squats, hamstring curls, and other exercises, you’ll improve your balance and low core strength. Make sure to avoid the transparent versions you can find at big box stores, which are more likely to pop. Instead, buy one from a proven fitness equipment retailer. Resistance bands are another affordable addition for your home gym. If you only need light to moderate resistance, they are especially ideal. Some types feature handles and door attachments that can transform them into a more affordable universal machine where you can do lat pulls, chest presses, squats, and shoulder exercises. If you want a more advanced resistance workouts, invest in a suspension training system that uses your body weight as resistance. Depending on what kind of cardiovascular exercise you prefer, you have a variety of options to choose from. If you’re just starting out and your budget is especially low, a simple jump rope can give you an outstanding cardio workout that also strengthens your core. in the future. By shopping around, prioritizing your needs, and buying pieces of equipment gradually, you can create a fantastic home gym over time. Now that you know more about how to create an effective home gym on a budget, click to download this month’s promotion and save on home gym equipment.